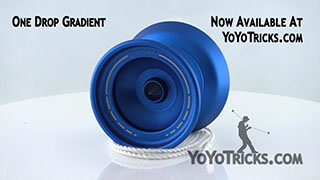 Review of the Flight Yoyo by YoYoFactory for Offstring 4a style play. 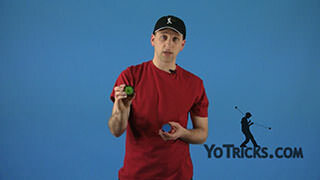 Flight Yoyo Review Yoyo TrickThis is the YoYoFactory Flight Yoyo. 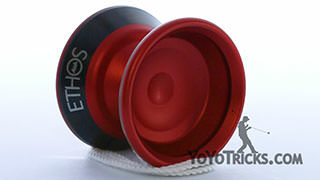 Obviously, this is an offstring yoyo. 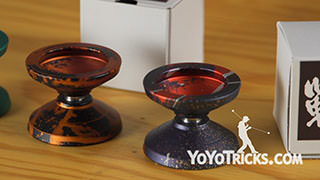 As you can see, the shape is what we would consider to be an ideal shape for an offstring yoyo. 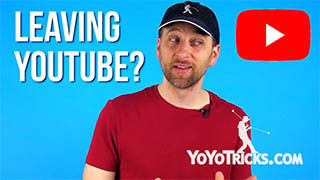 It is wide enough that it is going to make learning all your tricks pretty easy, but it is not so wide that it will interfere when you want to get into your more intricate tech-tricks. 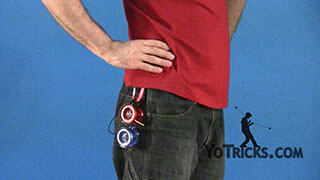 It also has a good diameter to make it really comfortable to hold and move around. It is really easy to see when you are doing it in front of people. 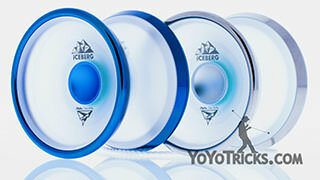 We feel like YoYoFactory really nailed the design in those respects. The gap is also, it seems to be the perfect width. 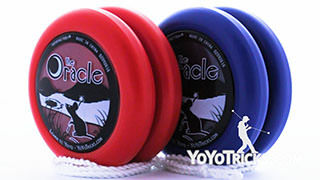 It is really good for your open-string binds, but, again, it is open enough so that the yoyo sleeps a really long time. 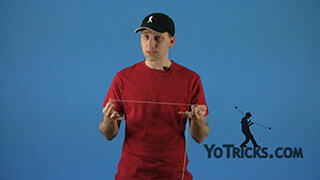 In fact, this is the longest spinning offstring yoyo we have ever tested. That will really help you when you get into more advanced combos. It is going to be a pretty big deal. 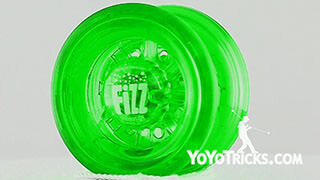 The other thing about this yoyo, you can see that it has this inner ring right here. That is designed for off-axis thumb grinds. 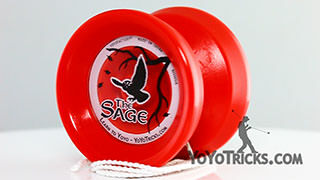 A lot of offstring yoyos are not designed specifically for those types of tricks. 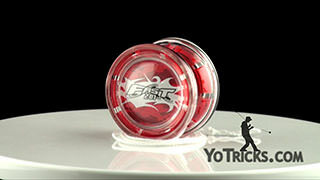 This yoyo is, and they actually did a really good job. As we will show you, one of the really nice features is that you do not actually need a glove to do those types of tricks. 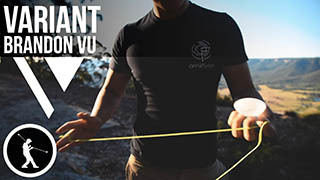 If you are they type of person that doesn’t really enjoy having a glove on while you do your offstring yoyoing, that is a really good benefit of this yoyo. 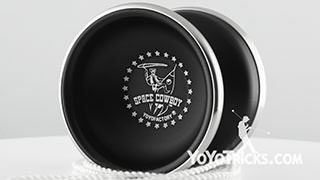 Another thing that is really nice about this, and again this is not something that a lot of offstring yoyos do exactly right, is this is really easy to take apart and put back together. 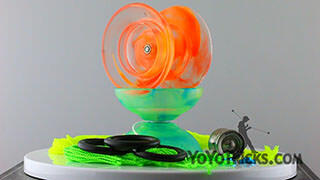 You will appreciate that while you are practicing, and of course when you need to take the yoyo apart to deal with the bearing, whether you are going to be lubing or cleaning the bearing or what not. As you can see the bearing is set one these two metal spacers. Another nice thing about this yoyo is that these spacers were designed to be not so tight fitting that you need a tool to remove them. Most of the time you can just get them off with your hands pretty easily. Even if they get a little bit stuck you can usually just pry it away with your fingernail, and in no time those spacers will come off. 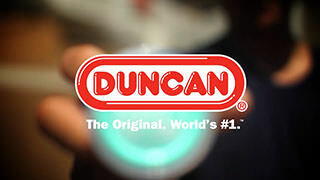 Again, if you need to do any type of maintenance on your bearing, it is just kind of nice that you do not need a tool to get those off of there. 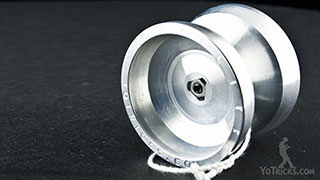 We definitely recommend lubing the bearing with Thin Yoyo Lube. 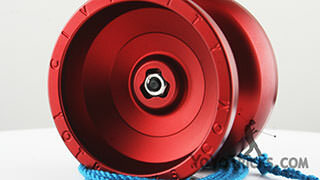 The bearing that comes in it is just a standard SPEC bearing, and that plays great. 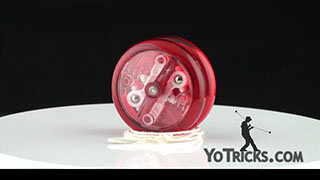 The Thin Yoyo Lube will keep that playing consistent and will keep that bearing lasting for a really long time. As you can see it also comes with white response pads. Those seem to play perfectly fine. If you are looking for a slightly more aggressive response you could also go with blue pads, or natural pads, and those seem to work well also. The final thing I want to mention is the string. The Flight actually works just fine with polyester string. 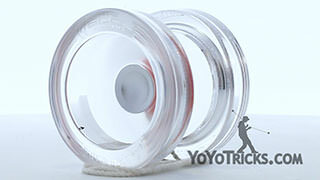 But we, actually all of us at YoYoTricks.com, prefer just regular Kitty String the best. 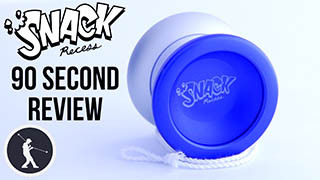 That seems to give it the right balance of really tight binds, it makes your open string binds catch in exactly the right way, but it also doesn’t snag up on you too much when you are doing your tricks. All in all it is just a very well thought out, very well executed design. It is made out of a really durable polycarbonate, the bolt is especially large, which, again, for durability’s sake that really helps. 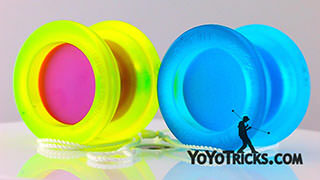 As you will notice, this yellow color, we call it Edge Glow Yellow, this is actually exclusive to YoYoTricks.com, whether you are performing, or just getting into Offstring, it’s a great color to have, and so again you will want to get that from us. Let’s see how it plays. 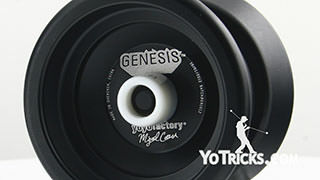 The first thing I noticed when I started using the Flight is that tricks that I really struggled with before because the spin time would die on long combos, with the Flight, not only was I able to hit those same tricks, a lot of times I was able to hit them twice in one throw because the Flight just spins that much longer than other Offstring yoyos. 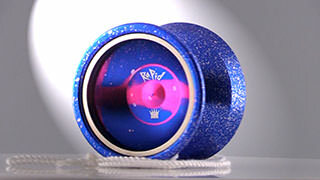 We have already talked a little bit about how perfect the gap width is set, what this does – practically speaking – is it allow you to hit your regens pretty easily and with a lot of control, and because there is a lot of spin time you will be able to hit more intense combos coming off your regens, which is great. 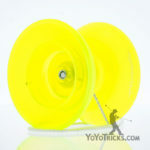 The yoyo is also able to sit on two strings, and yet at the same time it is able to hit your open-string binds with ease. 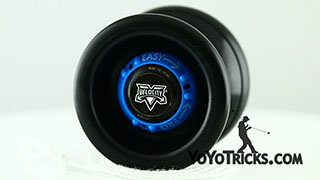 The other thing about this yoyo that is really great, that we have also mentioned is this area for your off-axis thumb grinds. As we said before, when you are doing off-axis thumb grinds with the Flight, you really don’t need to wear a glove to be able to do some really impressive tricks. What is great about that is if you are the type of player who doesn’t care to wear gloves during offstring style play then the Flight just has that one additional quality to offer to you. When you take all this stuff and put it together, the really long spin times, a shape that is really good for control when you are doing all different kinds of tricks, the ability to do some crazy tricks with your off-axis thumb grinds, you put all that together with a price of only $25, we just feel like anybody with even the most remote interest in getting into offstring style yoyoing, this is the yoyo they have been waiting for. 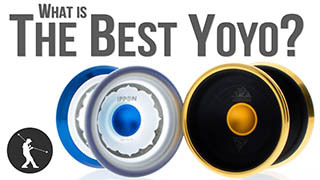 We are just super happy to recommend the YoYoFactory Flight to you, and to be able to make it available.